I’m going to level with you here. Despite the next line in ‘My Favourite Things’ being bright copper kettles and…, I had a very difficult time finding much by way of that specific product. Apparently the idea of using pure copper for your teapot is quaint and outdated, and while a search on Etsy nets plenty of vintage antique options, I literally found ONE supplier that sells said product, so the rest of this post is simply a play on the theme of copper in the kitchen. I guess the most logical explanation for the lack of copper options out there is the price – fair warning, today’s gift ideas are on the luxe end of things. The aforementioned glorious portion of this post – a bright copper kettle from English brand Simplex (which, no fear, has reasonable shipping – $12.50 outside the UK). If there is indeed a reason why we don’t drink from copper anymore, this kettle actually has a tin lining. And of course, if your stove is of the gas variety, there’s a slightly different model with the same copper sheen. A excellent decadent wedding gift. 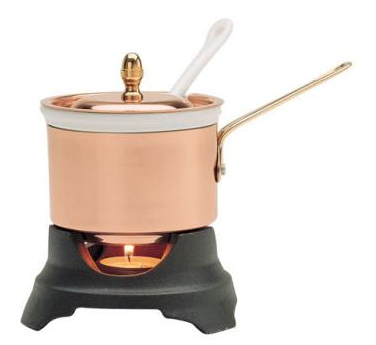 Ruffoni is a brand that exclusively sells copper pots & pans, including specialty items like this stylish chi-chi fondue set. Strangely enough they don’t have kettles, but their line of solid copper casserole dishes, stock pans, and baking molds are sure to inspire song-worthy happiness. There’s just something so striking about copper in the kitchen, particularly when it’s rendered in modern lines like with this cast iron + enamel combination. Is it pricy? Sure thing, but know there are some chef-worthy benefits to going the copper route, including more even cooking, or in this case, melting. Consider it as a romantic anniversary gift. Let me get this out of the way. 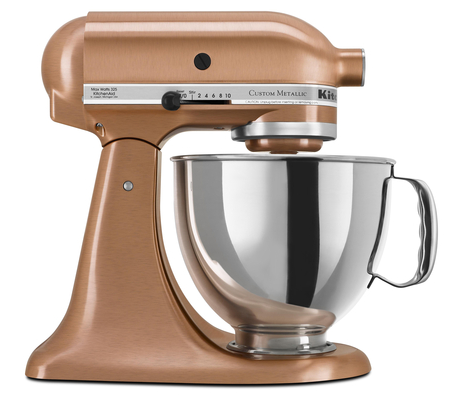 There is an actual copper (as far as I can tell) metal stand mixer available from KitchenAid – I just can’t seem to track it down anywhere. This is the next best thing I suppose – from KitchenAid’s Custom Metallic collection of their most covetable countertop appliance. Like all stand mixers, this beauty is a major multi-tasker that’s compatible with the line of add-ons and attachments, allowing you to whip up everything from pastry to pies to pizza dough. Personally I’m a big fan of the metallic collection, simply because most kitchens feature some sort of metal accent. This is a neat way to tie in (or contrast from) the other metals in your kitchen. This probably isn’t quite what Julie Andrews had in mind when she was singing her heart out about bright copper kettles, but it’s a fun play on the idea of hot beverages and copper finishes. 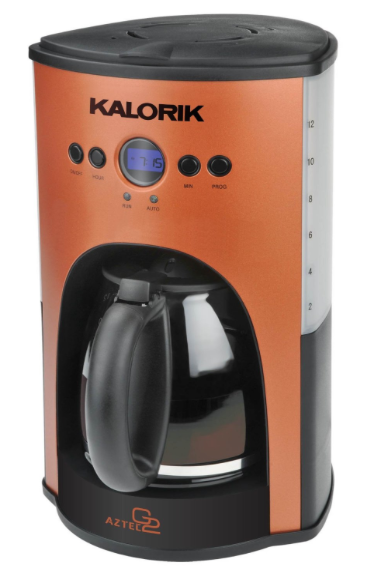 This 12-cup coffee maker would look equally at home in the break room of a lawyer’s office or the midtown loft of a twenty-something, and at this price point, it can afford to work in either space. The features are pretty standard: you can set a timer, it’ll automatically turn off after two hours, and it includes a glass pot, but the style factor makes it something of a standout. Finally I’ll leave you on an outdoorsy note. This Turkish open grill can be used for a rustic BBQ or simply as a fire pit, and makes a glorious decorative statement when not in use. Made from recycled copper and wrought iron, it can rock wood or charcoal, and includes a stainless steel grill to make cooking a cinch. 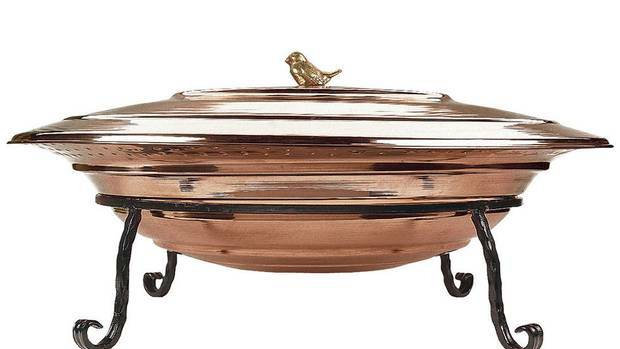 As with all copper – particularly that which is exposed to the elements – you can expect this shiny statement piece to eventually receive a pretty patina finish for an heirloom-worthy decor choice. I love this as an anniversary gift for your parents! Finally if you want a Love Is Art bonus entry, just leave me a comment telling me which one of these ‘Bright Copper’ gift ideas you love the most. The Turkish grill is my favourite, sitting out on a hot summer’s eve is something I’m looking forward to. 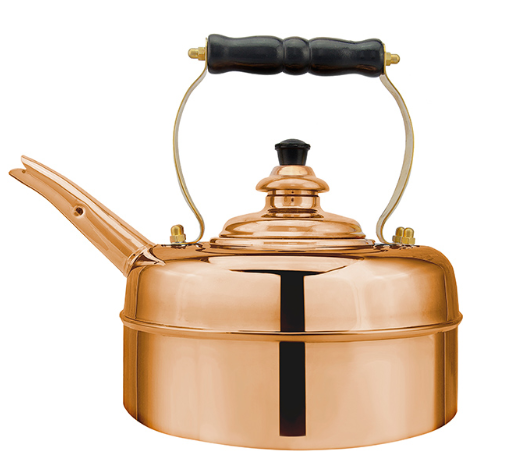 The High Gloss Finish Solid Copper Kettle would be a showcase in my kitchen. I like the look of the KitchenAid stand mixer. I love the Turkish Grill! Solid copper kettle because it looks easy for people with a disability to handle.